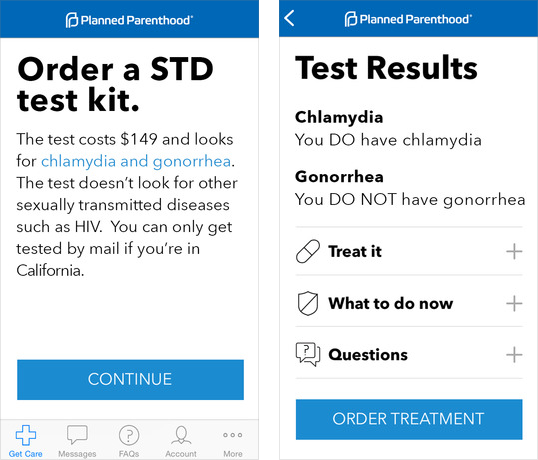 Planned Parenthood recently launched a new app, Planned Parenthood Direct, that will allow users with a California address to directly order a STD testing kit without having to interact with a healthcare provider. The kit costs $149 and will allow users to test for Chlamydia and Gonorrhea via urine. The kit is mailed to the address-of-choice in a discreet package with a return that is preaddressed and prepaid. The user has to only collect a urine sample and place it in any standard mailbox. The results are sent through the app after 5-7 days at which point the user can be given an electronic prescription if they are +chlamydia/-gonorrhea or a Planned Parenthood clinic referral if they are positive for gonorrhea as well. The typical treatment of choice for Chlamydia and Gonorrhea has been doxycycline and a single IM injection of ceftriaxone, respectively. The IM injection can’t be self-administered hence the need for a clinic referral. The $149 cost covers the kit and a possible clinic visit, but does not cover the medication. Planned Parenthood isn’t the first organization to develop the model of sending testing kits directly to at risk consumers. Prior to Planned Parenthood web-based sites with the same testing capabilities were available, like Johns Hopkins’ I Want The Kit (IWTK). However, Planned Parenthood is the first organization that has been able to create a convenient, yet private mobile platform that offers an end to end solution. Planned Parenthood has become active in the mobile health space over the past year. In 2014 Planned Parenthood launched a telemedicine pilot program, Planned Parenthood Care (iTunes link), in Minnesota and Washington that allows users to video consult with a health care provider for $45 to discuss birth control options and STI (Sexually transmitted infections) prevention/education (some health insurance is accepted). To receive a birth control prescription patients only have to obtain a recent blood pressure reading with no physical exam required. For the STI prevention/education aspect, health care providers can order an STI test kit, at which point the process is very similar to the California Planned Parenthood Direct. In fact, the new Planned Parenthood Direct app can be seen as a streamlined version of Planned Parenthood Care strictly for STI testing without the need of setting up a video appointment(saving $45 for consumers). This app has the potential to capture a large population that is either too embarrassed to get tested or too busy. According to the most recent CDC data it’s estimated that there are nearly 20 million new sexually transmitted infections each year, many of which go undetected until dangerous complications arise. Nearly half of these newly acquired infections occur among the 15-24 age group, a demographic that trusts mobile resources for their health.